For fans of the i Ching this app is a jewel, simple and to the point. Easy to use and fun to read. I just one wish: That the Richard Wilhelm book would be available to consult. As in my humble opinion it is the I Ching bible. I have owned and studied the Wilhelm translation of the Yi Jing for over 35 years. I’ve been waiting for an app that is worthy of the wisdom of this ancient resource, that provides all the angles and variations required to contemplate its many secrets - and this app definitely delivers. The interactivity and navigation of the features is pretty intuitive although if you’re new to the Yi Jing you won’t understand what many things mean. Congratulations to the developers who’ve created a Chinese Book of Changes app that is worthy of the ages! Post note: I did have some problems downloading and installing. The first time it didn’t install correctly and failed to open multiple times. I had to delete the app, power my phone off and on, then download-install again. The second time it worked well. My constant companion for years now - the updates have been super, and the reference books I most valued are available through the app. So appreciated. Great both as an aid to divination and as a resource for deeper study of the I Ching. great iching app! everything works! The best I Ching app possible, have used it for many years. I am grateful for it. That said, the app behaves bizarrely at times; I've lost all my readings a few times while syncing. And the privacy function is now a complete joke. Incredible resource for understanding the YiJing. Very fully-featured, with a beautiful interface, and an excellent selection of free or purchasable texts (definitely worth the money). HIGHLY RECOMMENDED! A friend introduced me to the I Ching almost 45 years ago. To have access to my favorite translations as well as several others in an app is amazing. There is so much to like here. You have my profound thanks for this! This is an excellent app not only for its easy to understand and elegant implementation of the Book of Changes, but also because it is one of the best designed and best supported apps I've ever purchased. Best app available for consulting the oracle. Availability of multiple translations allows for greater insight. I'll use this app for another fifty years. I found the IChing in Chinatown 1962 I was nine years old. When the yarrows stixs touched my fingers I knew I had found home. I am now 61. The IChing has guided my life. I have purchased this app for many friends. I am close friends with a very famous author of translations of the Tao te Ching and the IChing. I prefer this app to many others -- as I prefer sitting in lotus position following of tradition, I also embrace technology. Pay for the translation package and study. I've used this app for years on my iPad, and just installed it on my iPhone as well. It's my primary go-to I Ching resource these days and continues to exceed my expectations with each update. I love the ability to consult multiple interpretations and reference books (contextual to the hexagram I'm reading) with a button and a swipe; and it's equally cool to be able to mix up the coin toss method with yarrow stalks and more. The interface is well done, and the notes/sharing features are invaluable. Highly recommended for I Ching aficionados and new users alike. I have used this for three years. It allows you to pick from various translations, as well as keep a record of you questions. The app owner keeps this app up to date with constant improvements. ... And all the translations in your language. Terrific App. Support is excellent. I had a problem saving journal entries. Brian wrote me back shortly after I sent an inquiry with the answer. The quick method was only yielding one changing line per throw- discovered an option in the settings to change it back. Great app. Great app, very well designed, with a lot of attention to detail. I like that you can switch between different translations of the I Ching, and especially that four of them are already included in the purchase price. Also, the journaling feature is extremely well thought out, and even synchronizes across devices using iCloud, no additional configuration needed. Has easy to intuit use, pleasant setup, and downloadable books from some of my favorite and best scholars so you can walk around with a divinatory library. Please get Carol Anthony's book too! Dear Interested Buyers, I recently wrote a bad review of the updates to this app. Apparently my son made son changes that I didn't notice. The Makers responded right away with the solution. The simplicity, usefulness, and attention that come with this app make it well worth it. I have lived this app for probably eight years and would have rated it five stars most of that time. Today, it opens and closes immediately. I tried turning off the iPhone and re-installing. No luck. No other way to contact. Later: Yes, I love this app again. It’s now working. Thank you. This is by far the best I Ching app available. I had their earlier version with the Richard Wilhelm translation. It too is a great app, but when that app gave me a note that I could import the Wilhelm book into the this newer app, I became curious. To my delight, I found that this new version imported the full Wilhelm book I had in the other app and came with a few other translations. When clicking on the library icon, it took me to the store to buy more translations, but a few of them were for free and just allowed me to install them. Now, I have 6 translations that came with the app, carrying over the Wilhelm made it 7. I could then not help but buy Alfred Huang's, texts as well as that is one of my favorite translations. My next will be to get Balkin's. I love this app. It allows you to be in the reading of a hexagram and switch to another translation. No more going through stacks of books. They are are right at the tip of the finger. If you are a purest and think that a computer app cannot deliver the same experience as tossing your own yarrow or coins, then you could still do that and then come to the app and use it like a book, or should I say like many books and note have to look anything up. It is all right there in front of you. Best thing to ever happen to the I Ching. Now, if only they had the Taoist I Ching by Cleary, I would be very happy as I often consult this as well during readings. Love this app! Updates are perfect. Very reliable and attentive developer. Full featured. Love the journal. Really handy to flip between different translations to generate ideas. 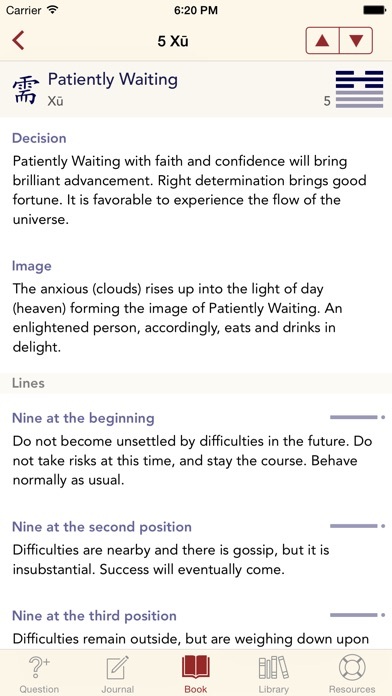 Overall a good iching app, however it has a fatal flaw. At some point you may want to delete a few readings from your journal only to discover that the entire record of your iching readings is suddenly and irretrievably lost! This has happened several times to me, I've lost 100s of entries. Also the app does not sinc between devices like claimed! The Best tool for reading the I Ching. Worth the price of an iPad just for this app! I've been an avid user and student of the I Ching for more than forty years, and I love love this app. I've recommended it to many of my students who use it everyday. The various translations available in the app are phenomenal. Whether your a scholar or beginner this app is indispensable! Best Yi Jing / I Ching app on the platform. Great support, responsive & helpful developer. Refreshing my review. i use this app everyday. As a long term daily student of I Ching, I dreamed of an app like this. It does everything and in an elegant way. Thank you so much. Technically this is the best designed app I have ever used. It is easy to use, has a clean attractive layout, and manages to include access to multiple facets meaning with each hexagram. With all of my heart I wish I could get this app designer to fix all the other apps I have down loaded. The design is perfect! I can switch between translations, read indicated lines, see future hexagrams, find the internal trigram images, or view a matrix of related hexagrams with a single touch. A word about the translations. This version of the Yi Jing from flat earth studio has four good translations of the I Ching preloaded. The Wilhem-Baynes version which all other versions can only be compared to can be added for 4.99 or you can buy the other flat earth studio version of the app which only has the Wihelm?Baynes translation. If you have the money I recommend that you get this version and add the Wihelm translation to it. Sometimes the other versions add that extra bit of insight. I learned to read the traditional coin method in 1991. I really appreciate this app as a convenient way to do readings on the go and store them easily--in a way that can be accessed and shared from anywhere and won't get lost. My only suggestion is the add Master Huang's classic book back into the interpretations available to select in the app. I’ve used this app for a few years now and was very pleased to have found it. I used a previous Mac based program developed at Princeton University which I really loved, beautiful artwork and soothing music, but as it required a version of the OS no longer available for years I was without a handy tool like this one. Others I tried just didn’t “feel” right, and by that I mean the algorithm that replicates the randomness of the coin or yarrow stalk toss to generate the hexagrams. The results just didn’t seem to match the question as I’d experienced when using the manual method. I didn’t feel the insight into the current situation as I had in the past. This app felt right from the first “toss”. I use both the iPad and iPhone versions, and just did a reading on the iPad. When I picked up my iPhone there it was. I’ve reloaded this app on several iPhones and iPads and my old readings thankfully are always there. I highly recommend this beautiful program. May you find wisdom and humility, and make the journey across the great water to find your center and the peace that brings from the storms of life.. 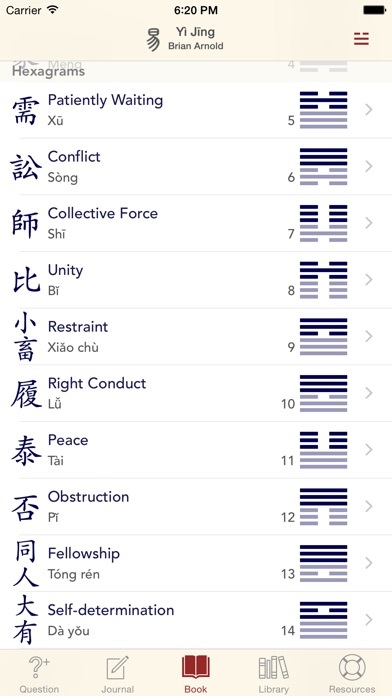 This app is an excellent resource for cultivating a better understanding of the I Ching. Switching between translations is easy and the comprehensive array of casting methods includes the ability to manually enter results so ritual can be preserved. I have been using this app for several years now. It has a gorgeous user interface. It is well organized, and lovingly supported by the developer. It is regularly updated with new texts available for in-app purchase. I have seen continued reliability through the operations and functions. The only problem I have came across is when I decided to enable iCloud syncing on both my iPhone and iPad apps. To recover the journals that I lost after enabling iCloud syncing I followed the steps described below. First I backed up the journals as-is on my iPad by emailing them to myself. Then I went into the settings app and disabled iCloud syncing. I then relaunched the app and my missing journals had returned! (Do not be alarmed if the journals you have created since enabling iCloud syncing have disappeared, they will repopulate once you reenable iCloud syncing.) Again, I exported the precious journals I thought had been missing by emailing them to myself (you will manually input these later after reenabling iCloud syncing). Once I confirmed receipt of my backup, I then reenabled iCloud syncing in the settings app. Upon relaunching the app, all of my post-iCloud-syncing journals reappeared and the missing journals were once again missing. At this point it was but a small chore to manually input the many valuable journals I thought I had lost from the backup I had emailed to myself earlier, YMMV. For those that purchase this app, but want a copy of the Wilhelm-Baynes translation, this can still be done! It does require that you purchase the I Ching version of this app, also created by Flat Earth Studio (and probably available only in the US App Store). 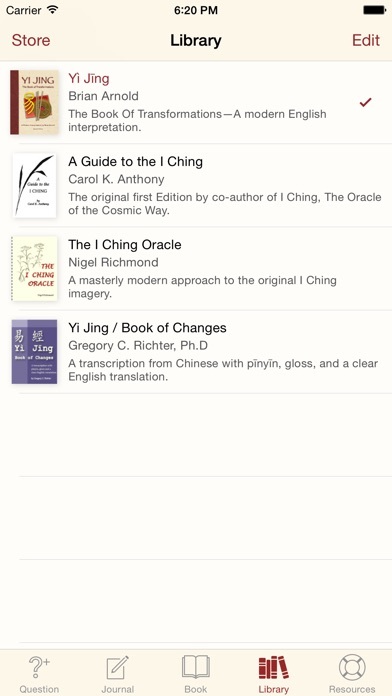 Once you purchase the copies of the books that you desire from the Wilhelm-Baynes translation in the I Ching version of this app, under help you can then sync those purchases to this app. This enables you to access these precious translations in this, the Yi Jing version of the app. The I Ching version of this app is available only in the US App Store. The Yi Jing version is the international version of this app. Due to licensing restrictions by Princeton University press, distribution is only allowed in the US version of this app, as far as I understand. Thus, this workaround may only work for US customers. I still use yarrow stalks for my consultations and love the fact that I can manually input my journals into this app. This is an appropriately respectful and inspiringly beautiful way to bring your precious I Ching consultations into the 21st century! The depth, polish, and sincerity of this app are unparalleled. I cannot imagine a better implementation, and I'm impressed by the way it has stayed updated to current machine specs and layout. Very good. There are countless methods to do your reading, you can type notes and a title for important questions and your thoughts on any reading, tons of resources to get different angles on your reading, and best of all you can password your readings so other people will never know what you did readings on! I must finally add my 50start review to the many other glowing reviews. For many years, I had relied upon my Wilhelm-Baynes hardcover and yarrow stalks. After moving overseas, and sadly no longer having them, one day I happened upon this app, and lo and behold, it is the most perfect and beautiful implementation I can imagine. I have now relied upon it for several years, just as I did my hardcover. The availability of translations, multiple oracles, easy-to-navigate commentary, and reading modes is unparalleled. I have hundreds of apps, I truly believe this is the most well-designed I have ever seen. 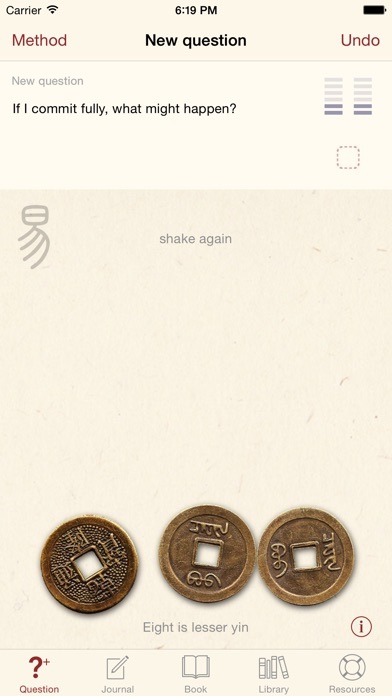 As a user of the I Ching for years, I especially enjoy this app . 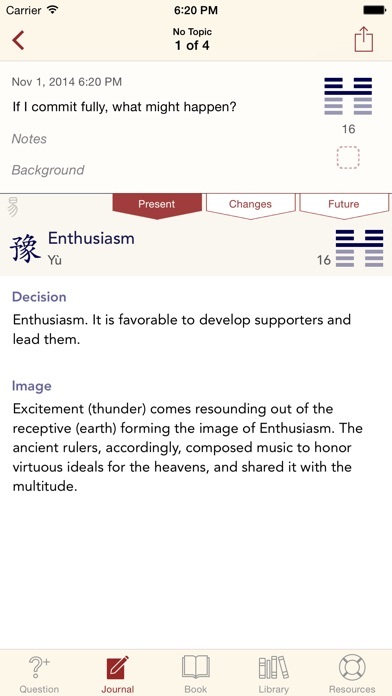 The variety of translations available and the obvious high regard that the creator of the app has for the I Ching is most impressive. The I Ching has saved me on many occasions and I love that this app allows me to reference so many translations, creating a clearer picture of the situation at hand. As a long time practitioner of the oracle / book of wisdom, I have used this app since version 1. The app works; it offers access to the best translations; the journal is quite functional, for both capturing and reflecting on patterns and past throws; the developer is good and responsive. No reason to look any further! I love this app. It puts the iching in my pocket. I can examine multiple translations side by side. It has great journalling. I bought this one years ago and have seen nothing but value from the purchase. The expansion of available books, the ongoing capacity to keep notes, and the flexibility of casting methods all serve to put this version of the I Ching at the top of the heap. This is the one you want, folks. This is by far my favorite I Ching app on any platform. It is what I recommend to both beginners and the experienced. It's all in one features include everything from casting methods, I Ching texts and journaling. I've been using this well designed app for years and many updates. Some of my favorite features include manual entry which allows me to enter yarrow stick and coin readings alongside the comprehensive casting methods provided in the app. The journal is extensive and has survived years of use and device swapping. The selection of I Ching books is the best available, and now includes both Master Huang and Nigel Richmond, my two favorites. The developer is very responsive and dedicated to the app. This app is an essential part of my daily routine on both my iPhone and my iPad. I highly recommend this app. I erased this app and when I brought it back, my old notes were there. Easy to use. I recently began to study the Yi Ching and came across this app. It is amazing! The price is a bit higher than standard apps but totally worth it! The design is great and very easy to understand especially for a newbie. In an age where there are some poorly designed apps out there, this one has some great attention to detail and accuracy. I hope you all consider doing a tarot card app next!